John Paul Strain Hand Signed and Numbered Limited Edition Giclee:"McNeill's Rangers in Moorefield"
Image Size: Paper 19.25 x 21.75/ Canvas: 19" x 21.5, 25" x 28.25" and 32" x 36"
Edition: Signed and Numbered Giclee - edition of 250 on Paper and 165 Canvas editions. About the Art: The exciting heroic tales of Southern cavalry have captured the imagination of Americans for generations. The moments once remembered of superbly mounted horses charging forth in line of battle with spurs pressed to chestnut flanks, sabres flashing, and guns blazing have aged into legend. One of those cavalry units was an independent partisan command organized by Captain John Hanson McNeill in Moorefield Western Virginia. The unit was commissioned by the Confederate Congress in September of 1862, Company E of the 18th Virginia Cavalry. They became known as McNeill's Rangers. Captain McNeill and his Rangers began immediately to raid Federal installations, railroads, and wagon trains, causing havoc throughout the countryside. It was said that over 20,000 Federal troops were diverted to protect the B&O Railroad from repeated Ranger raids. In 1863 the Rangers severely damaged the railroad and burned the machine shops at Piedmont. The President of the B&O, John W. Garrett reported to the US Secretary of War Edwin M. Stanton,"the extensive machine and carpenter shops of Piedmont have been burned. The engine and cars of the east-bound main train and two-tonnage trains have also been destroyed. Five other engines damaged. ... The heat of the fire at the wreck of the trains at Bloomington had been too intense to permit much work." 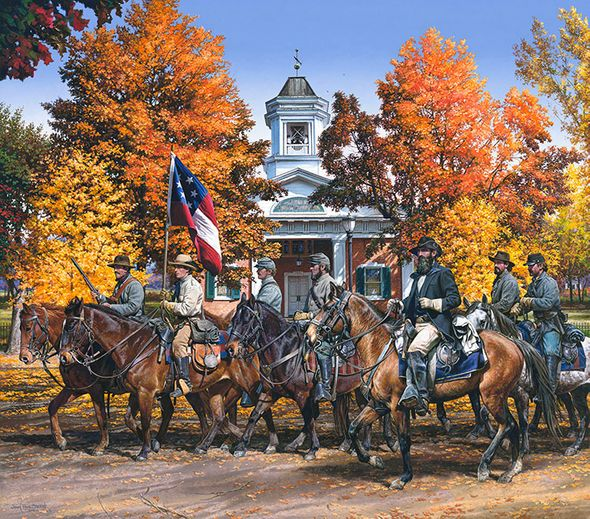 In one of the most daring cavalry exploits in the war the Rangers captured two Federal Generals in Cumberland, Maryland and rode away in a snow storm chased by Federal Cavalry. Confederate General John B. Gordon said, "In a daring dash it is the most thrilling incident of the entire war." McNeill's Rangers had forever marked their place in Southern history. -J.P.S. Description: All Prints are sale priced every day! Professionally Frame any print from our dealer gallery starting at an additional $199 and receive free shipping! No thank you, I just want the 19x21 unframed print.